Shanghai always brings the grand and glorious furniture industry expo to the attention of the worldwide furniture makers every September. This year, the Furniture Manufacturing & Supply China (FMC China) and FMC Premium will be held again in Shanghai New International Expo Center on the eastern bank of the Huangpu River from September 11 to 14, which will show-case the frontier intelligence and creativity of the furniture industry chain from all-inclusive as-pects, including accessories, semi-finished products, techniques & processes, conferences & events, to equip such fields as furniture manufacturing, decoration and engineering application with excellent materials and accelerate the high-end manufacturing 3.0 transformation of the Chinese furniture industry. With growing disposable personal income, the population of upper and middle classes is ex-panding rapidly. According to the latest forecast, the global proportion of the Chinese middle class will rise from 4% in 2009 to 13% in 2020, turning domestic customers into the main force of the furniture consumption upgrading. Expanding demands for high-end furniture makes the upstream high-end manufacturing extremely important. The concept of “high-end manufacturing” was first put forward In the 2017 exhibition, and now the organizers with extensive experience over the years are seeking to make it an engine for the upgrading and transformation of the Chinese furniture industry. FMC China 2018 by draw-ing on the industrial advantages has formed such competitive categories as furniture, leather products, hardware, textiles, timber finishing, upholstered components and chemical engineer-ing. Meanwhile, it will even break the limitation on industrial materials and techniques by intro-ducing brand new fields like high-end furniture materials, semi-finished product processing and smart software development with the purpose of driving groundbreaking furniture material ap-plication and scientific and technical innovation, promoting refined development of the industry, and leading the industrial upgrading. In terms of area, the exhibition this year will occupy large exhibition areas in seven exhibition halls, i.e. Hall N5 for premium furniture, Hall N7 for leather products, Hall N9 for hardware, Hall N10 for timber finishing and chemical engineering, Hall W10 for furniture and materials like mat-tress, textiles, latex, Hall E8A/E8B for outstanding materials and Hall W3 for high-end uphol-stered and mechanical furniture, covering furniture, raw and auxiliary materials of various cate-gories and levels and attracting over 640 exhibitors to show their upgraded high-end manufac-turing and refined exhibits. As a high-end part of FMC China 2018, FMC Premium 2018 will cover the whole Hall N5. The exhibition hall, built with environment-friendly green materials by integrating the conception of “being standardized, modularized and finalized”, represents a typical green construction per-fectly combing functions and aesthetics. For the exhibits, the organizer focuses on premium material quality and original design. After careful screening, at last more than 200 material sup-pliers have been selected from both home and abroad to exhibit their products in Hall N5. This grand industrial exhibition will gather high-end and advanced exhibitors with exhibits of unprec-edented excellent quality. 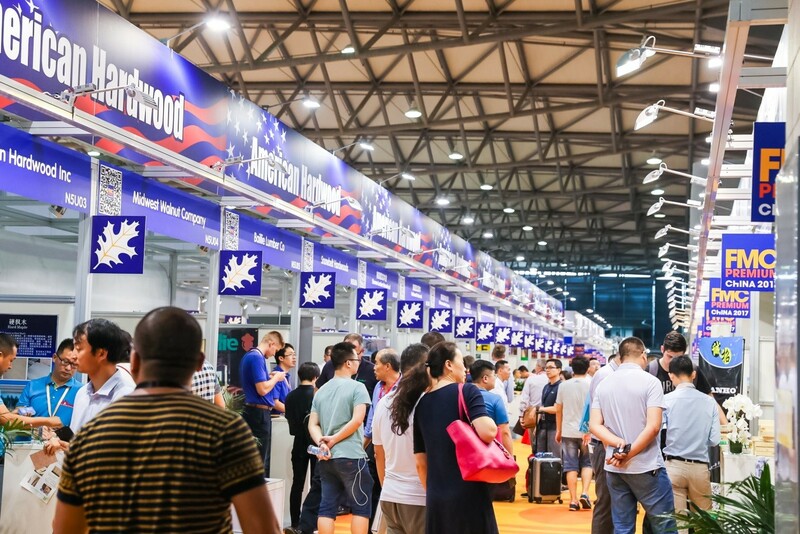 It is noteworthy that the foreign exhibitors this year are more powerful than ever before, includ-ing AHEC, FrenchTimber, Swedish Wood, KFFIC and QWEB. Besides, the domestic Furen Group will lead its subordinate members to participate in the exhibition to display outstanding timber products and timber process technology both at home and abroad. AHEC will gather over 30 participants, covering 10% more area than that of the last year. Swedish Wood will rejoin the exhibition together with 10 members to display more than 30 pieces of Swedish-designed furni-ture made of Swedish red pine and other woods, which must be very impressive. As a featured part of the exhibition, the home textiles area in Hall E8A/E8B takes up 30% of the total exhibition area. Apart from outstanding products from home textile exhibitor groups of Haining, Yuhang and Foshan, it will also display various products of soft decoration, home tex-tiles, wall coverings, mattress and linens from domestic and overseas top brands in the field of home textiles and materials, including Qianbaihui, Maya, Aotansi, Artsky, Tianyang, Meixin, Xin-yada, etc. The exhibition area is a must-visit part for both furniture suppliers in search of quality materials and decoration designers seeking inspiration and trends! In addition to exhibits of upgraded quality, the theme events this year will also surprise you with many highlights. As early as the middle June, the organizer held the four-day “upstream and downstream indus-trial linkage event of visiting famous furniture manufacturers”, where technicians from suppliers of furniture materials, leather and hardware and designers from soft decoration companies visit-ed famous furniture enterprises in Jiangsu Province, Zhejiang Province and Shanghai Munici-pality to discuss and exchange on product technology, furniture design, national policies and current market development. The event has been highly thought of by all participants. It is told that after having been held for four times, this event has become a more direct and efficient way of solving the pain point of material application for the downstream enterprises and seeking new products and technology. Besides, last year’s highly popular “Colorful Home” opening ceremony and the first forum themed on “Encountering Colors” will be followed by the event with the theme of “Decoding Colors” this year, which will unfold an exploration into colors with “real materials” to decode the popular colors applied in home decoration in the next three to five years in China. It will consist of “8 color schemes, 8 exhibition areas and 8 color boxes on 4 themes” designed by the chief planner, Professor Song Jianming, the director of Color Institute, China Academy of Art. What’s more, many famous Chinese and foreign scholars on chromatology will gather in the fo-rum to share their stories about colors, including Lu Tao, Zhai Yin, Monika Haag and Zhou Xin. The event will feature “Colorful Home Annual Conference Proceedings” and many other high-lights, and will be presented in E8B-D60 exhibition areas. We await you to attend the exhibition, to witness this future-oriented color event. FMC China 2018 will further integrate different divisions of the furniture manufacturing industry via better exhibition layout. It will strive to shape a grand, more inclusive and high-end profes-sional exhibition for the furniture manufacturing industry chain, so as to promote breakthroughs and development for the Chinese furniture industry in design innovation, new materials and technologies, and it will also follow international mega trends of industrial upgrading, and drive the whole furniture manufacturing industry onto a higher stage. Come and join us in FMC China 2018 this September!